Saved By Grace Church - In Every Thing? One well known and favorite bible verse of many Christians is 1 Thessalonians5:18 which reads: "In every thing give thanks: for this is the will of God in Christ Jesus concerning you." Even among those who have memorized the verse, many seem to ignore or overlook the fact that this includes even things that are tragic and painful. The great hero of the faith, Job, apparently knew this eternal truth many centuries before the Apostle Paul even penned the words. He had just passed through the most painful series of events one can imagine when he uttered these words: "Naked I came from my mother's womb, and naked I will depart. The Lord gave and the Lord has taken away;may the name of the Lord be praised." (Job 1:21) He may have done it with halting speech and a devastated heart but He praised God anyway. Job's wife on the other hand, had the same mind set of many people in the world, those who will quickly and easily thank and acknowledge God when He "blesses" them but will just as quickly express their rage and defiance when things go the other way. When Job's wife encouraged him to just curse God and die because of their troubles, he immediately admonished her for her selfish foolishness. One Sunday in church, a man and his wife heard of a couple who gave a significant love offering in memory of their son who was killed in a battlefield. On the way home, she said to her husband, "Why don't we do the same?" He quickly replied, "Why? Our son wasn't killed?" She replied, "Exactly!" This is precisely what our initial bible verse teaches us, that we are to thank God in every thing. 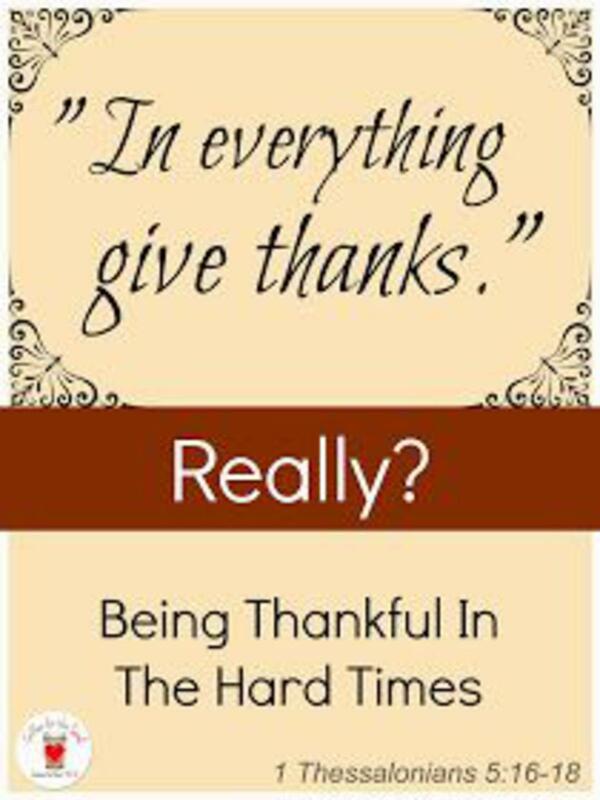 I realize it is very difficult for all of us to thank God when we are going through a painful experience. God knows it too, but He also promised that He would never give us anything we couldn't bear and would give us a way to endure. (See 1 Corinthians 10:13) What's even better is that He promised never to leave or forsake us. (Hebrews 13:5) Keep in mind that any thing God has ever asked of us or has planned for our lives is geared for our benefit. Lets not forget to thank God in every thing! We will have many reasons for it every single day. Memory verse for the week: (Hebrews 13:15) "Through Jesus, therefore, let us continually offer to God a sacrifice of praise--the fruit of lips that confess His name."